In the middle of the former garden of Hohenschwangau, only a short walk away from the castle, is the little Schwansee (Swan Lake). This sleepy lake is attractively set in the Allgäu mountains, with the wooded Schwarzenberg and Kienberg, forming a backdrop. A path around two kilometres long leads round the completely unspoilt shore. There are impressive views looking east from the valley to Hohenschwangau Castle with its battlements, which is reflected in the lake, with Neuschwanstein Castle forming a picturesque backdrop. The Schwansee has an area of approximately 0.2 square kilometres and measures seven metres at its deepest point. 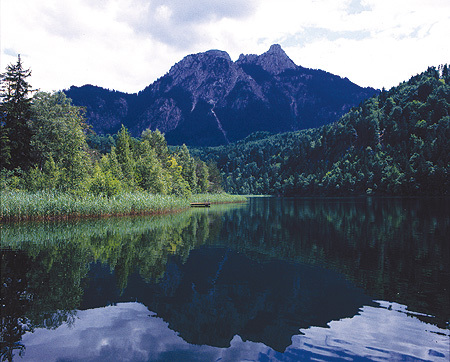 Since 1956 it has been part of the "Alpsee, Schwansee and Faulenbacher Valley" nature reserve. The Schwansee is located 3 km southeast of Füssen in the park formerly belonging to Hohenschwangau Castle.